Oren loved to analyze stories long before he knew what a developmental editor was. He enjoys bringing out a story’s strengths and then polishing it until it shines. As a writer himself, Oren prioritizes giving feedback that is constructive and actionable. He became a full-time freelance editor after graduating from the University of Washington Editing Certificate program, and since then has worked on dozens of short stories and novels. He’s particularly fond of speculative fiction, and he is continually fascinated by worlds that are not our own. Ready for the next step? Order editing from Oren or learn more about our content editing services. 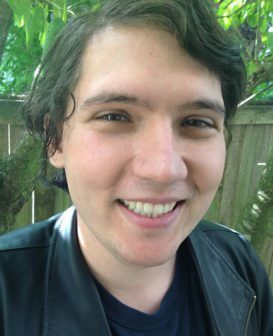 Oren has a BA in Fiction Writing and History from Evergreen State College and a Certificate in Editing from the University of Washington. Since joining Mythcreants in 2013, Oren has written hundreds of articles, many of them analyzing stories and promoting best practices in storytelling and writing. Oren stepped up as an editor at Mythcreants in 2015 and began doing freelance fiction editing in 2016. Since then, Oren has consulted on stories large and small. His process focuses on identifying author goals and offering practical options for meeting those goals. Oren has received an overwhelmingly positive response to his work. Here are just a few of the accolades he has gotten from clients. Oren clearly put the same level of thought into his development edit that I put into my novel. Nearly every suggestion he made was incisive and on the mark, a remarkable feat considering that the totality of his comments was longer than most of my short stories. He even provided his in-depth feedback well before the date he’d promised. I’ve probably received close to a thousand edits over the years, and Oren’s was among the most helpful. I highly recommend him. Oren did a fantastic job with my manuscript. From the beginning, he understood my vision for the story and characters and what changes I needed to match that vision. He pointed out many key issues within the story and gave suggestions on how to fix them. His suggestions were on point and brought up issues I had not considered before. Immensely helpful! Oren did two developmental edits and one comprehensive edit of several of my short stories, and his work was worth every cent. For the developmental edits, he started with a list of questions about the stories which made me think more deeply about the foundations of the stories (and made me wonder: Why the heck didn’t I think of that?!?). He pushed me to resolve motivational problems, remove unnecessary characters and scenes, restructure an entire story, and rethink how I approached gender stereotypes. His questions and suggestions made me focus on the true core of my stories. When my beta readers read the revised versions, they all thought there was a huge improvement. More importantly, I thought so, too. Witness Oren’s analysis skills and advice in action by sampling his articles. This is only a small fraction of what he’s written. See the full list here.